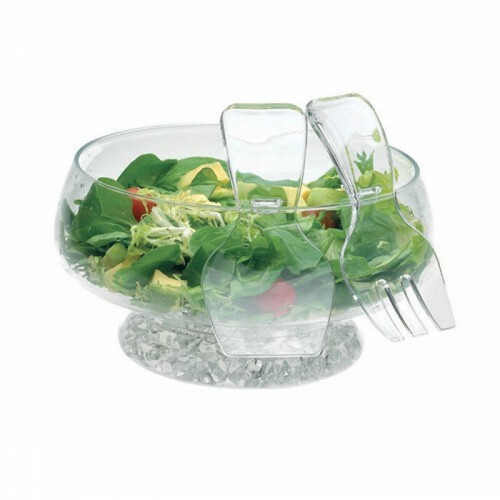 This Acrylic salad bowl has a vented ice chamber and a serving spoon and fork, perfect for keeping your favourite salads and fruits chilled. The salad's bowl ice compartment can be filled with crushed or cubed ice for chilling and then the grill cover is replaced to separate the ice from the salad or fruit. The salad servers have a wide head and handle for ease of serving, they can hook onto the bowl when not in use. The salad bowl can be used indoor or for outdoor dining, the bowl will really show off your colourful salads.